Slovenly language corrodes the mind. I freely admit that I am a linguistic pedant. I care about how people use words, what words mean and how definitions are ignored or manipulated. Punctuation matters deeply to me, and someone’s written grammar can influence my abiding opinion of that person in the face of many other positive indicators. 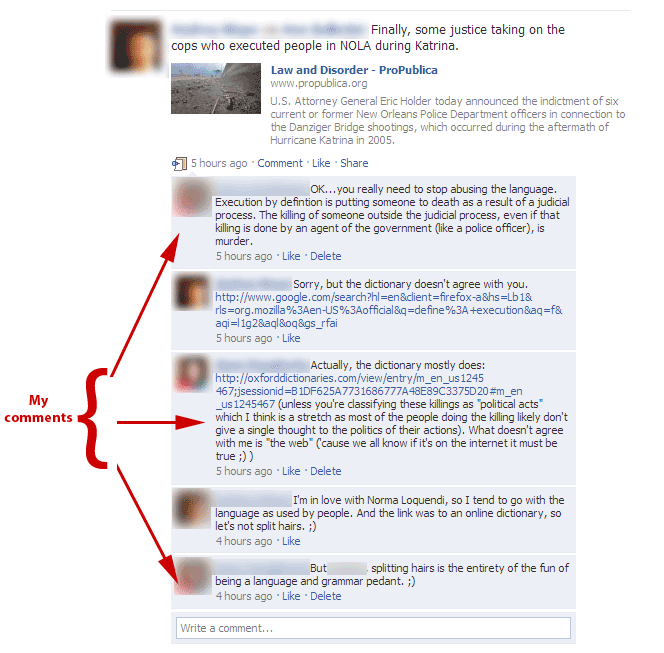 This is why I get so frustrated when supposedly intelligent people use language in ways that are just plain wrong. Because if I reposted this exchange as text it would be searchable. The whole point of Facebook is to share content: what you’re doing; links you find interesting; notes and funny cartoons; and other effluvia about your life. Facebook’s share module allows you to post a personal note with anything you share to, theoretically, make it more relevant to your circle of friends. A former co-worker/Facebook friend of mine is a self-proclaimed liberal feminist. She has lots of political hot button issues about which she routinely posts articles. These hot button issues include: oppression of women in any form (about which she comments something along the lines of “It’s the PATRIARCHY!“); how bankers and the rich are totally screwing the American public (usually accompanied by some comment about how this justifies walking away from your mortgage); homeopathic medicines (insert angry medical rant about the harmful fraud they are); and, of course, racial injustice (some meant to be ironic comment about how we all don’t totally ignore racism at every turn). In the past few days her interest in American culture’s embedded racism has manifested itself in her posting of articles about the Oakland transit cop who shot an unarmed teenager and, just today, about the New Orlean’s police officers charged in the shooting deaths of civilians on the Danizger Bridge in the aftermath of hurricane Katrina in 2005. It’s the personal comments with these postings that have activated my not so hidden inner pedant. Connotatively, we’ve all got an idea of what an execution looks like and, hence, what it means. Our mental picture probably involves screaming mobs and guillotines, or possibly one blindfolded guy standing against a wall with a lit cigarette in his mouth. But I’m willing to bet that for each of us that connotative definition of execution involves the element of judgement by some judicial authority, valid or not, prior to death. Denotatively execution has a specific meaning as a noun and execute has a specific meaning as a verb. Both the Oxford English Dictionary and Merriam-Webster agree that when it comes to the meaning of the word execute in relation to killing some legal sanction or political motivation must be involved. For the purposes of this discussion we’re going to ignore the “or for political motivation” aspect of this definition as that implies some sort of organized political rebellion like, oh, the French Revolution. Legal sanction in these definitions means that the decedents were first involved in some official process that passed judgement on them for violating established laws the outcome of which was a sentence of death that was then carried out with the full weight and authority of the system of laws in our country. Legal sanction implies within the framework of an established legal system. “Legal sanction” does not mean that a BART police officer or a couple of New Orleans PD members decide they don’t like the way someone is acting so they have the authority to decide on the spot to kill them. But wait, what about the idea that yes, police do have the authority to decide if someone is a threat and to use deadly force to stop an individual? Isn’t that legal sanction? Yes, it’s legal sanction of a kind which gives judicial seeming authority to individual police officers in the face of manifest deadly force on the part of another individual but if the police had perceived and it could be proven that the decedents were exhibiting such deadly force there would be no judicial trials around these incidents, no actual legal sanction against the officers involved. Everything would be handled administratively and none of these officers would be making their way through the court system. In the particular case of the transit cop in Oakland, video tape of the event, produced by four witnesses, cast enough doubt that the decedent exhibited deadly force that the transit officer involved was tried on a charge of murder. So, since no legal sanction, either judicial or, for lack of a better classification, administrative was involved in any of these killings, which is specifically the point of the articles on both these incidents, it seems to me to say that the decedents were “executed” is patently incorrect and is being done, quite frankly, for unnecessary shock value. Sociologists, psychologists, anthropologists, economists, and pop culture mavens have noted a trend in the past few years: we tend to restrict our information gathering to sources that already agree with our established opinions. This isn’t surprising given that we tend to form friendships with people who believe similar things as us. Social networking merely highlights this propensity. Now, if your social network, which already holds similar positions as you do on a wide variety of issues, is so jaded that the idea of police officers murdering unarmed individuals isn’t shocking enough and you’ve got to resort to using the word “execution” to get their attention you’ve got some serious problems. What really bothers me, though, is not just that she is abusing the language for shock value but that she selectively decides when words are important and when they aren’t. This is a woman who insists on politically correct language when it comes to anything relating to feminism or “women’s issues.” Precision is paramount and yet I’m being asked to “not split hairs,” which is, by the way, just a more polite way of saying “stop being so argumentative” which is something that men often tell women when they want us to just STFU, when it comes to characterizing something as a state sanctioned killing (an execution) versus a murder (a killing outside the law often punishable itself by state sanctioned death). Really? Really? It also bothers me that this supposedly smart person doesn’t know the difference between a Google search result for a word definition and the definition provided by The Oxford English Dictionary (it’s a link to an “online dictionary” after all). Maybe I’m giving her too much credit in the intelligence department. Maybe she really believes that our system of laws actually backs up a police officer any time he shoots an unarmed civilian. Maybe she actually thinks that these killings were political acts rather than fear or frustration responses. Maybe she actually doesn’t understand the difference between these ghastly murders and when someone violates our laws, is caught, and a structured system passes judgment on them that the crime was so heinous and the chances of a similarly heinous crime being perpetrated again by the same individual are so great that the only reasonable punishment is death. Both these incidents, the one in Oakland and the one in New Orleans, were absolutely horrible and I’m in no way justifying or supporting the actions of these police officers. Videotape in the Oakland incident proved to a jury that the teenager who was shot to death likely wasn’t posing a deadly threat and the cover up of the facts surrounding the shootings on the Danizger Bridge leads one to believe that the officers involved knew they did something wrong. Quite frankly, I’m not a supporter of the death penalty any more either. I think that you should have to work a lot harder to get sent to prison than you have to work now, that prison should be a lot more uncomfortable than it really is, and that there are some crimes that are so repulsive the only way justice will ever be served is if the relatives of the victim get to poke the perpetrator to death with sharp sticks over the course of several days. But even though I don’t agree with it, my country has the death penalty in many places which means it’s important to make a distinction between killing we allow and killing we punish. So while I don’t disagree with her ideology, perhaps my inner language pedant has provided a path for me to see my “friend’s” political outrage for what it really is: hypocrisy. And that is something that bothers me more than abuse of the language. * Edited to remove snarky <acronym> comment about homeopathy. I am 40 today (in about 15 minutes actually). I had a dream about zombies last night, the slow, shambling, Shaun of the Dead kind. Does that mean anything? Likely not. Part of me thinks I should have something profound to say, but I don’t really. All I have is a few basic lessons that it’s taken me a life time of bumps, bruises, successes, failures, missed opportunities, and luck to accrue. They aren’t much, but they’re what I’ve got. 1) I am not special. Except that I am. When I was younger, my biggest fear was that I would grow up to be average. Nothing special. Nothing extraordinary. Just…average. Not surprising given that I grew up on the cusp of the self-esteem movement that has spent the last 30 years convincing kids that yes, they are special. Specialness brings up some interesting quandaries. If everyone is special, then no one is special. Conversely, everyone has, until they prove otherwise, the potential to be special. But what about the idea that yes, we are all special, but in a very micro way? We are special to the people who love us. We are special because we make a great blueberry buckle or a fabulous hamburger or know just the right thing to say to a friend who is in emotional pain. No, we aren’t all special on the winning awards, walking the red carpet, getting the girl and the millions kind of scale but most of us matter to at least one person, and, in my opinion, if we’re living our lives correctly we matter to at least one person a day for no other reason than because we have the opportunity to perform a random act of kindness. 2) Saying no and saying yes are of equal importance. The key is to know when to say which. Nothing can get you in trouble faster than saying no when you should say yes and saying yes when you should say no. The hard part of life is knowing when to say which. There is no harm in pausing, in taking that few seconds or minutes or days to figure out what it is you really want before you make your answer. If the person asking the question can’t wait or pressures you to decide quickly back away until you have achieved maximum blast distance and then some. You will be better off in the long run. 3) The past can not be changed. The only thing you can do is learn from your mistakes and better in the future. I have made mistakes. Little ones, big ones, and a couple of whoppers. With some of them, I am the only one who had to pay a price for my bad decisions. With a few, others have been along for the ride with me. It is unfortunate, then, that I am prone to regret, a useless emotion that serves no purpose but to eat up energy that could be better put to moving on, to making myself better and the world a better place in general and specifically for those I love. The only thing they have in common is that every single one of them contained a lesson either about my behavior or about other people. If you can not let go of the past you have not yet learned its lesson. And sometimes the lesson isn’t what you might first think. Unpack the mistake, unpack the circumstances that led to it. Figure out what the actual lesson is. Then let go and move on. It is the only way life can proceed. Nothing, save promiscuously trusting people who have not earned that privilege, can get you in trouble faster than taking yourself too seriously. It sets you up for pranks and it inflates your ego to the point where you think that you are invaluable (you are not except on micro level (see point #1)). It is possible to be earnest, which I am, without taking yourself too seriously but in our culture which encourages that “serious as cancer” mentality through brutish machismo, the difficulty of achieving that balance is immeasurable. But the struggle really is worth it. 5) Do not underestimate the importance of both fun and play. “In a hundred years, who is going to care?” is a question I ask myself on a daily basis. Part and parcel of the brutal machismo of seriousness that pervades our culture is the idea that you have to take everything seriously. No, you don’t. Some things can be blown off. Some things can be ignored altogether. True, some things must be attended to with all due haste but if everything in your life supplants fun and play, why are you bothering? 6) Don’t look at the dogs. Work the lock. I’ve gotten distracted in the past few years. And while getting distracted can sometimes lead to new, fun, experiences, it’s kept me from paying attention to what is important. Figure out what’s important to you – which won’t necessarily be what society or anyone else says is important. Pay attention to that. 7) Life is a system. Some rules can be bent. Others can be broken. Some can be ignored completely. And no one is going to tell you when the rules change. It’s taken me a long time to perceive that fact that life is just a series of systems and that it is up to me to figure out which rules I want to follow. Accepting systems whole is no longer, nor was it ever really, sufficient. It is my job if I am to live a happy, fulfilled life, to not only determine what the definition of happy and fulfilled are but to determine whether I want to follow the rules of a given system or if I’m willing to pay the price that might be attached for bending, breaking, or ignoring them. And don’t rely on any outside entity to notify you when the rules of a given system change. It is up to me to figure out what the state of play might be and how I want to participate, or not. Tomorrow is the first day of the rest of my life…just like yesterday was. When Hemingway killed himself he put a period at the end of his life. Old age is more like a semicolon. I thought this apt as I struggle with how to interweave my various plot threads. No word count update today. I’ve been scribbling by hand the past few days which is very physically satisfying but not so easy to keep track of.